Maybe you’ve also taken note of the knitting needles and yarn sticking out of oversize purses on the subway – perhaps even needles in action. 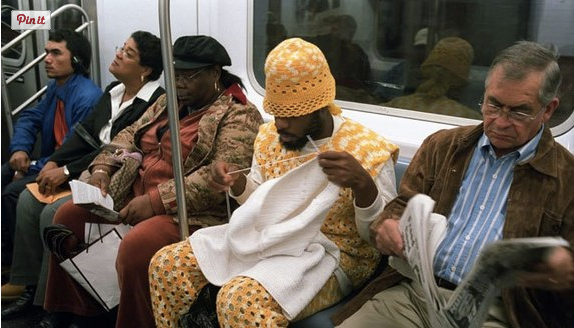 Do you knit on the subway? But, like, WTF (as your favorite Millennial might text) does that even mean? Last month the New Yorker published a tongue-in-cheek report about a supposed grandparent revolt against the Millennial appropriation of “grandma” and “grandpa.” The piece, by Cathy Lew, pointed out that Millennials are using the word “grandma” when they really mean something along the lines of “couch potato” or “I just want to stay home Saturday night and do craft projects,” and “grandpa” as the descriptor for a certain type of boring sweater or outfit fetishized by a subgroup we’ll refer to as hipsters. In “Grandmas Rise Up Against Millennials’ ‘Grandma’ Lifestyle,” Lew quotes “real” grandmas who say the appropriation has nothing to do with real grandma lifestyles and everything to do with a stereotypical retrograde notion of crazy cat grannies, boring stay-at-home grannies and/or craft-obsessed grannies. And in the opinion of one Bertha McGee, the media’s to blame because of the lack of diversity in its representation of seniors. You’re either a Golden Girl or a cat lady. Maybe she saw Buzzfeed’s recent “22 Signs Taylor Swift Is Actually 82,” which included references to Swift’s love for cats and holidays, her relationship advice and her craftiness. For more, see “Grandmas Rise Up Against Millennials’ ‘Grandma’ Lifestyle” in the New Yorker. What do you think? Are you offended by the “grandma” trend or is it cool to be admired for who you really aren’t? Well, it seems that “grandma” is being used to mean what people have always like about grandmas — they’re cozy, secure, restful, comfortable. Much better than age being seen as a communicable plague that needs to be quarantined. I like the Millennials. And the fact that they think the trappings of age — accurate or not — are cool endears them to me even more. It took me a while to realize what was going on, but I’ve learned to recognize when I’ve pushed their “grandma” buttons — they get this kind of “Awww!” reaction and I start getting cosseted in a distinctively sentimental way. I think it’s just adorable. I don’t like being put in a reference place as I get older because I AM living, continuing and the Millennials don’t get it. They just imitate. No soul. I have history, memories, foundation, more than tech gadgetry. The worst thing I didn’t have while growing up was continuous electronic distraction. This article was very funny. I am so out of it with modern culture trends, I had to click on Normcore. 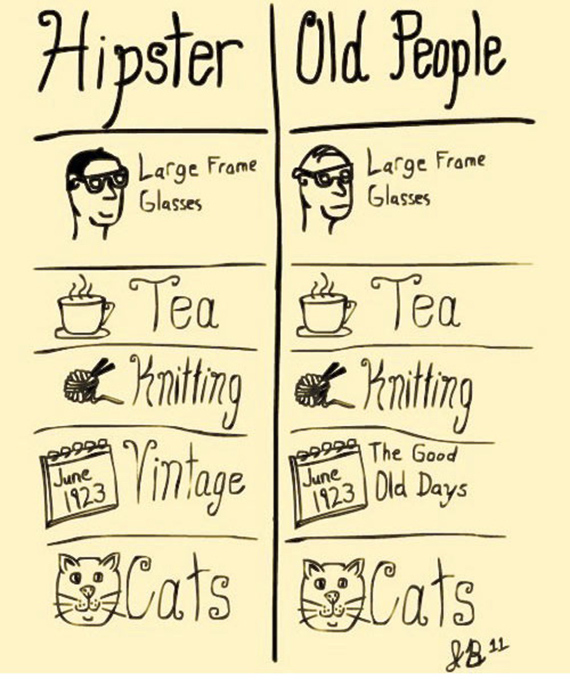 I love your chart comparing hipsters and grandmas. I liked the New Yorker article as well. I did not know about this expression “being a grandma” either. Stereotypes are strange.